EWING, N.J.--(BUSINESS WIRE)--vitafusion™, America’s #1 gummy vitamin brand, is proud to announce the introduction of vitafusionTM Organic, a new line of USDA certified organic supplements including: Women’s Multi, Men’s Multi, Vitamin D3 and Vitamin B-12. We fuse together essential nutrients with the best organic ingredients into delicious gummy vitamins. vitafusion™ is the only gummy vitamin brand that is clinically proven to absorb vitamins C & D3+. 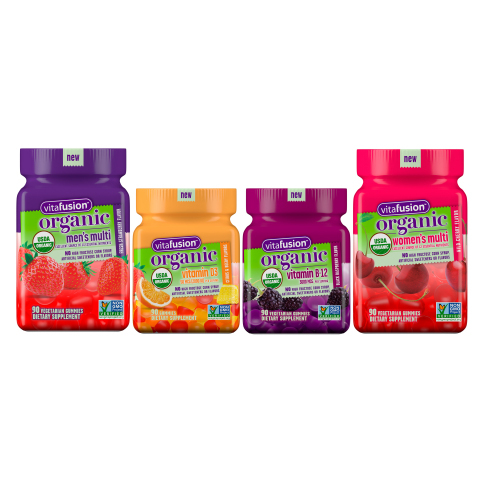 vitafusion™, America’s #1 gummy vitamin brand, is proud to announce the introduction of vitafusion Organic.